These tender, chocolaty Gluten-Free Chocolate Cake Donuts will melt in your mouth. They only require a few ingredients, and they bake up super quick. Start your day with a delicious warm donut straight from the oven. I love Gluten-Free Chocolate Donuts, and so do my girls. I use them as motivation for getting my girls out of bed and getting them ready for school. 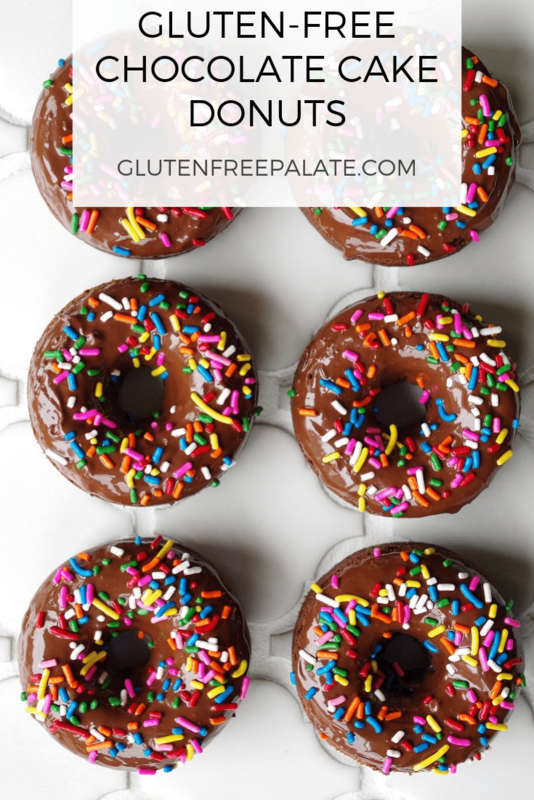 I first shared these gluten-free chocolate cake donuts on the blog in 2014. I’ve recently given them a refresh. If they get ready for school on time all week, they get to enjoy a gluten-free donut for breakfast on Friday. What better way to motivate yourself to get through the week than with a donut? I can’t think of any. So, gluten-free donuts it is! One of the many things I love about gluten-free chocolate donuts is their versatility. Yes, I just used the word versatility in the same sentence as donuts. There are so many things you can do with a donut, from its cake base to the toppings. My favorite topping for these gluten-free chocolate cake donuts is chocolate glaze. My girls like to go all-out and add sprinkles. The options are endless. You can enjoy these Gluten-Free Chocolate Cake Donuts plain, or top them with your favorite glaze. Every person who has tried these donuts has said that you can’t tell that they are gluten-free. If you make these donuts, please stop back by and let me know what you thought! If you don’t have a donut pan, I highly recommend getting one (otherwise you won’t be able to make donuts). I use the Wilton Non-Stick Donut Pan (affiliate link to amazon that doesn’t cost you anything extra). It’s inexpensive and really is non-stick. 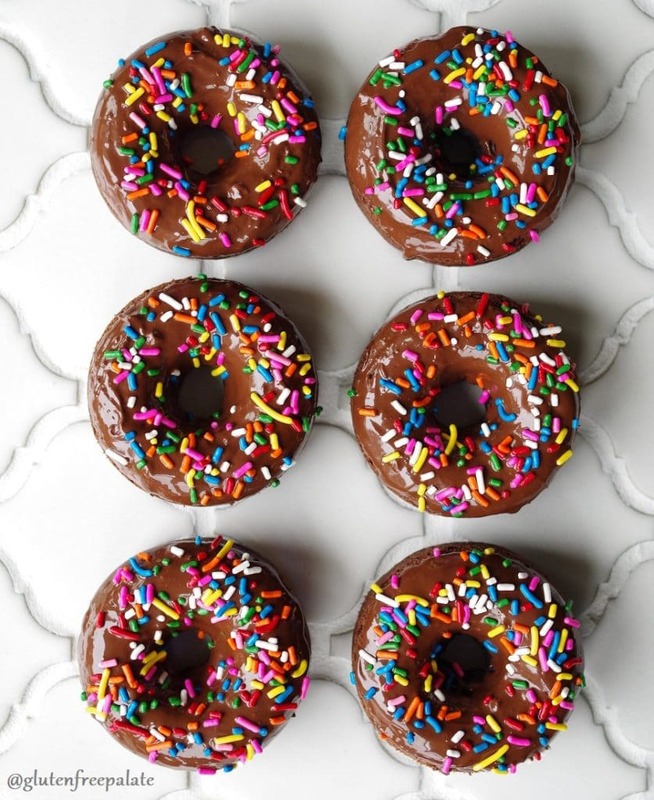 I have two for those days when I want to make a double batch of Gluten-Free Chocolate Cake Donuts, or other donuts. I also have a mini donut pan, which I like to use from time to time. Donut pans are inexpensive. You can usually get one for under $10 and I’ve seen them priced as low as $5. Can I make gluten-free donuts in a muffin pan? Sure. You can make gluten-free donuts in a muffin pan. Just watch the time as donuts tend to cook quicker in a donut pan do to the contact of the pan around the donut and in the center. If you like donuts (and who doesn’t?) you might also like my Vanilla Birthday Cake Donuts, or my Gingerbread Donuts. Or both! Like I mentioned before, we do donuts every Friday. I have at least ten recipes for donuts on my site and I also have a roundup of gluten-free donuts. If you are shopping for a donut pan, I use this affordable Wilton Donut Pan(affiliate link) when I make donuts. You can use whatever donut pan you like, just make sure it’s non-stick. Note that most donut pans don’t need to be greased before using, but some do. Yes. 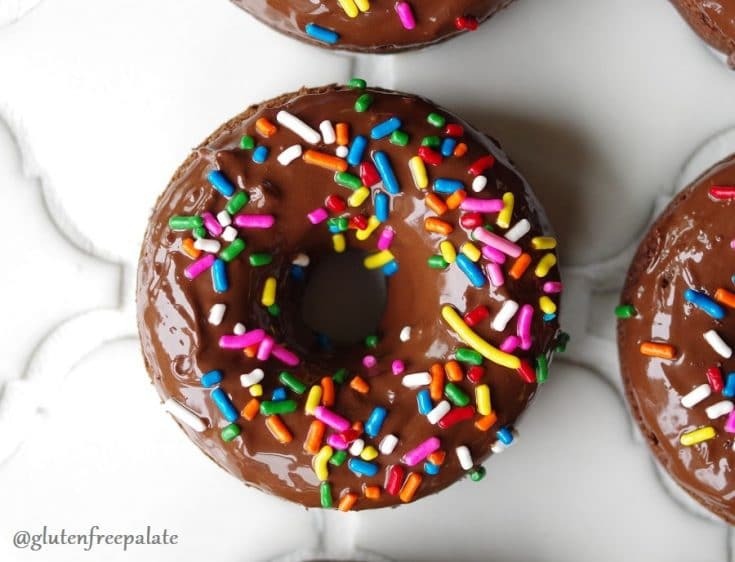 You can make these gluten-free chocolate cake donuts dairy-free. Simply use dairy-free milk, and dairy-free butter. 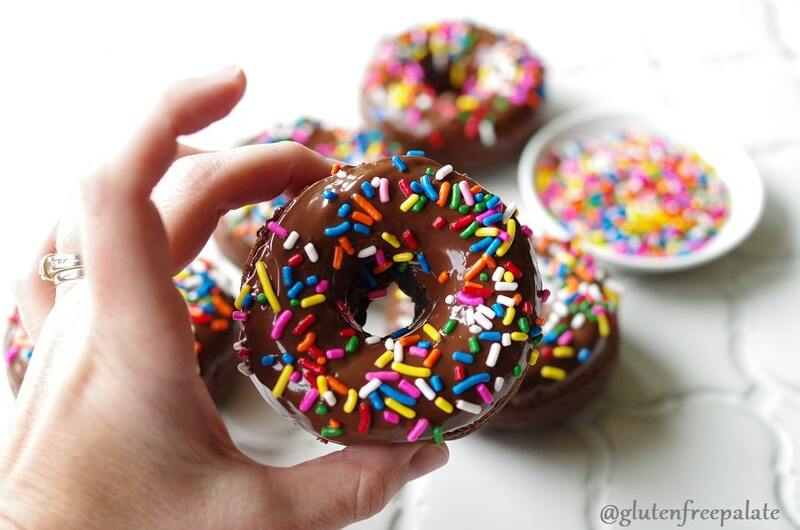 Make sure to also use a dairy-free chocolate if you are dipping your gluten-free donuts in a chocolate glaze. If you are looking for other donut recipes simple search for “donuts” in the search bar at the top left of the page. 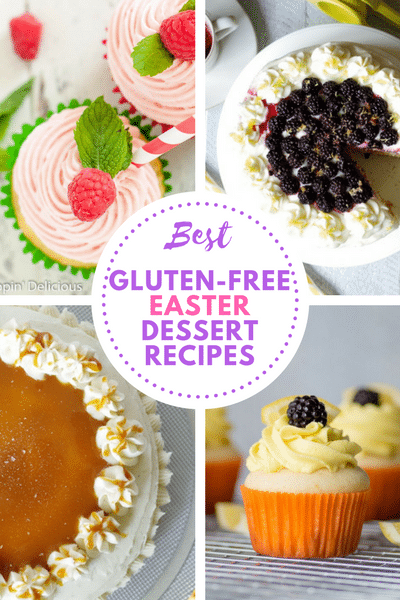 Here are some of my favorite gluten-free donut recipes. Making gluten-free donuts is easy! Just a few simple steps and every day ingredients, and you have some simple gluten-free chocolate donuts. For the donuts- Preheat oven to 350°F. Spray the donut baking pan with non-stick cooking spray, dust lightly with gluten-free flour and set aside. Place all dry ingredients in a medium mixing bowl and whisk till combined. Add milk, egg, vanilla and butter. Whisk until smooth. Fill each donut cup in the donut pan 1/2 full with the batter. Bake for 10 – 12 minutes or until a toothpick comes out clean. I recommend starting with the lowest time and checking progress. For the glaze- Whisk together all ingredients until smooth. You may need to add additional powdered sugar for a thicker glaze. Dip the top of each donut in the glaze. Serve it warm or at room temperature. Store in an airtight container for up to 3 days. Did you make these gluten-free chocolate donuts? Please stop back by and let me know what you thought. I always love hearing from people who make my recipes. Also, if you made any of my gluten-free donut recipes be sure to let me know what you thought. 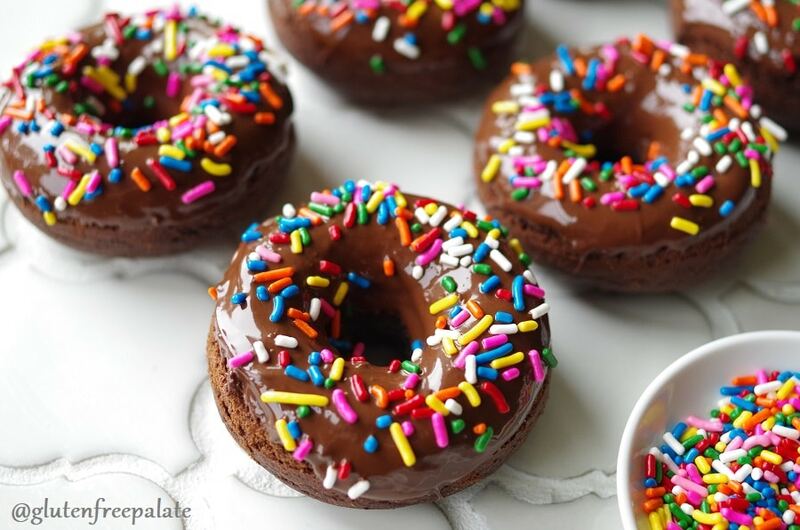 These tender, chocolaty Gluten-Free Chocolate Cake Donuts will melt in your mouth. I just made these with a mix of white and brown rice flour and they turn out so light, fluffy and decadent! Definitely pin this recipe! I subbed coconut oil for butter and water for milk. Thank you for letting me know that you enjoyed them 🙂 I love knowing that you subbed out the dairy and they turned out. Thanks for sharing! First, let me tell you how DELICIOUS these are. I’ve made these several times and this is one of my favorite go-to recipes. However I had to make a few adjustments. This may vary for different ovens, but mine needed to be in there for 30 minutes for the batter to set and toothpick come out clean. This may be related to the oven timing, but the batter also needed more milk in order to squeeze through the bag when filling the doughnut mold. The original 1/2 cup made it smooth, but not smooth enough to squeeze. Again, this is one of my favorite recipes and I make this at least once every couple of months! So glad you like them! Would you mind sharing what gluten-free flour blend you used? and if you used a metal pan or a silicone pan? I’ve made these more time than I can count, and they should not take that long to bake. Donuts don’t typically take a long time in the oven, as they have contact with the pan and have approx 1/4 cup of batter. Yummy recipe! I haven’t had a chocolate donut in 2 years since going GF! I used 4 tbsp coconut sugar and 2 tbsp brown sugar. I needed to add 3 tbsp more milk to make the mix smooth enough to come out of the bag. Thank you for letting me know you liked them! Depending on the exact flour blend used, they may absorb more of the liquid. So glad you were able to adjust to make them work with our flour blend. Thank you for the recipe! These quickly became a family favorite! I substituted xylitol for sugar and they turned out great! These are delicious! I subbed in 1/4 cup of almond flour, which I usually do. It makes a moist consistancy. Also needed more milk in icing. Over all VERY good. I will be making these over and over. Thanks for the recipe! These are amazing. Thank you for sharing. Wonderful! I added cayenne and espresso. I used the espresso in place of part of the milk. I used the remainder of the espresso in the glaze. Sounds delicious! Thank you for letting me know. Just I have been checking where to find the sprinkels and I have discovered that they contain gluten. So be careful… if you have a brand free of I would love the name. Not all sprinkles contain gluten. A few brands we like Sprinklez, and Color Kitchen. There are several more brands. Would these still turn out the same if using an egg substitute? I always use Ener-G egg replacer. They would still turn out great. The texture will be slightly different. I’ve also used flax egg in this recipe with great results. I really want to try these, but I’m wondering if the gluten-free flour blend has to contain xanthan gum? I buy Bob’s Red Mill gluten-free without xanthan gum and am wondering if that ought to work? I’m allergic to corn and apparently xanthan gum is derived from corn–regardless I react to it. Chrystal, Love these donuts! They are better than the ones we used to buy at the local supermarket. They always turn out, tho I do have to increase the baking powder a bit. Anxious to try your other recipes. Thank you so much for the hard work! I’m so glad you like them! I’m not sure why you’d have to increase the baking powder, unless you are a lower sea level, perhaps? Thank you so much for stopping back by and letting me know. I made these with my GF 4 year-old. Great recipe and easy for a kid to help. We were both very excited to have donuts again. We have the Wilton pans and ended up with 10 fluffy good-sized donuts. The recipe says it makes six but you can definitely get more!! I can’t wait to make this recipe and already saved it. I was wondering though, do other vanilla extracts contain gluten? I use the Kirkland brand. 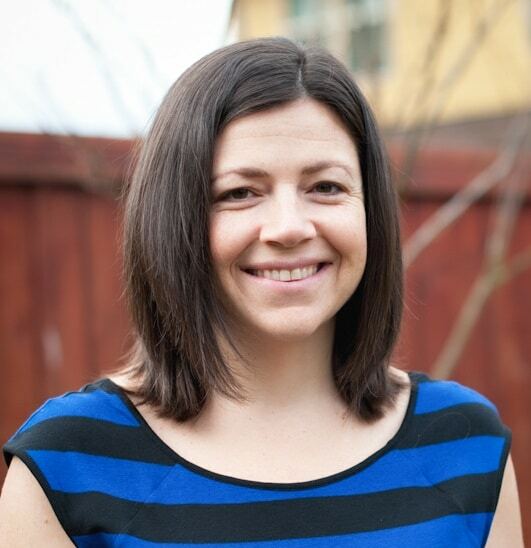 Thank you and thanks for sharing your recipes! These were a huge hit along with your birthday cake recipe!! Thank you! 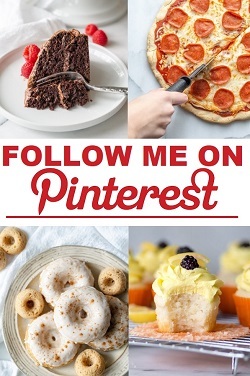 Do you think you can make donut holes with these recipes? I did this today using chocolate almond milk. They were great! Thank you for sharing the recipe! I am so glad you like these donuts. Thank you for stopping by and leaving a comment. Just discovered these! So good! My grandson who is not GF said he liked them better than Dunkins! Lol, everyone loved them! Thank you for a simple recipe! I’m so glad you liked them! Thank you for stopping by and letting me know. These were delicious! I made the cinnamon and sugar ones, too. Both were wonderful. I did have one odd thing happen to both of them. After they were cool, I put them in an air tight container (like tupperware). The chocolate glaze softened and a lot slid off the donuts. With the cinnamon sugar, the cinnamon and sugar melted into the donuts. With both it happened a few hours after I put them into the containers. Is there such a thing as too air tight? 🙂 My house doesn’t get above 74 degrees and it is cooler in the kitchen than that since it is further from the fire place. Maybe I should keep them in the fridge? Thanks for the wonderful recipes! I am so glad you like them! Yes, it’s best to store them in the refrigerator or freezer. The room temperature can “melt” the topping depending on the temp and humidity. Found the donut pan I bought a few months ago and decided to try your chocolate donuts. I can’t believe how good they are. The chocolate glaze was the icing on my donuts but I exerted self-control and stopped before I added sprinkles. A glass of milk and I am in heaven! Will definitely be trying your other recipes! I am so glad you like them! Thank you for stopping by and letting me know. Hi Chrystal, We made your birthday cake donuts this weekend, and my gluten free-dairy free-soy free family loved them! We’re going to try these next. Can you share more info about how you freeze them? Is the frosting already on? How do you defrost them? I’d love to have some on hand, but feel unsure of the freezing/thawing details, if you could spell it out! Thank you!! 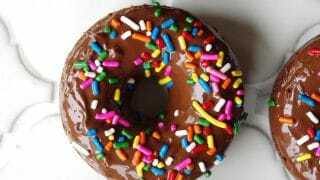 I am so glad you like my birthday cake donuts recipe! For freezing any of my donut recipes, I have done it both ways – freeze them with the glaze and freeze them without the glaze. We usually reheat them in the microwave for 15-20 seconds if we’re in a hurry. Otherwise, you can leave them to defrost in the refrigerator, reheat them, then glaze them. If you glaze them before, the glaze will melt when you reheat them but they will still taste yummy. My girls don’t mind melted glaze one bit.